Do you have this booklet at your school? I couldn't find it at our school, but if you can't find it at your school like me, don't you worry~ because here is the e-version just for you!!! The reason that I was looking at this booklet on QUEEN'S BIRTHDAY, is because I was thinking of the ICT expo that our school might have in term 3 or 4 this year. We had one last year to celebrate the end of our ICT contract. It was a great opportunity to show what we have done using ICT to parents. They were all astonished by the amazing work that their children have done. I think our school should have it every year and to suggest that to our ICT team and other staff, I need some information about the importance of the relationship between e-learning and whanau. While searching for some information, I found this booklet (which I have seen and used before, but haven't used it for a long long time). On pg 18, it has the section about e-learning and family, whanau and community participation. We, educators, all know how important it is to make a connection between the school and whanau/community in order to enhance student learning. However, it sometimes does not happen well, especially in low-decile schools. The situation gets worse when it comes to ICT or e-learning as majority of them do not have internet access or even computers at home. One of the main reasons that the school/classroom wikis or blogs at our school do not get used by students and parents after school is this. By having an ICT expo, it will give parents an opportunity to see what their children have been doing or can do with ICT, and also give students an opportunity to 'show off' what they can do. 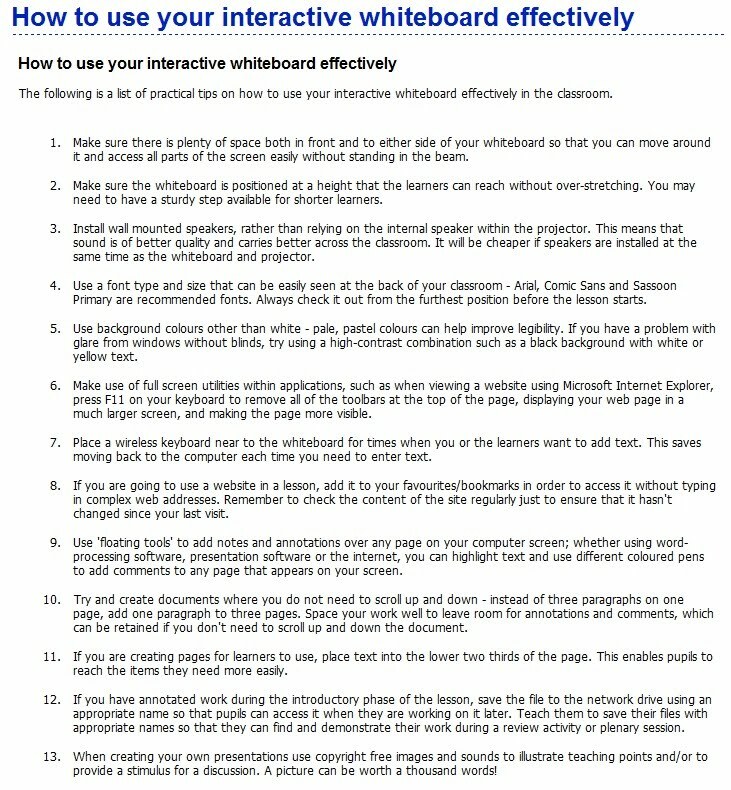 Today, I'm going to talk about interactive whiteboards. My school bought five Mimios a bit more than two years ago. 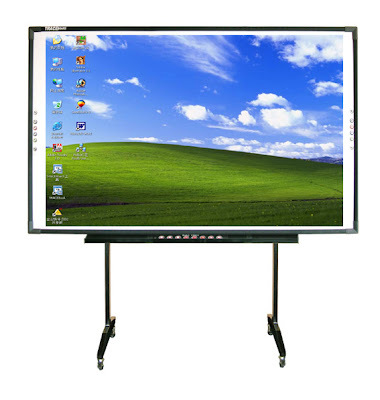 We decided that our 4 ICT lead teachers can have one each in their classroom and rotate one among other teachers. As I am one of the ICT lead teachers, I was fortunate to have one in my class. It's been more than 2 years I've had it in my room and I'm using it nearly every day.. However, I don't think I am using it 'appropriately'. I use the screen all the time to do warm-up activities, show video clips and pictures. 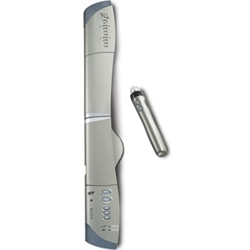 But, I am not using the mimio pen (which is also called as a stylus) enough. Well... When I want to use the screen, all I have to do is to turn the TV on and connect it with my laptop. But when I want to use it interactively,, I need to turn the TV on, wait for at least 20 minutes for it to warm up, connect the mimio and then calibrate it. I think I should be more prepared... and keep 'encouraging' myself to use it more often. Oh! Look what I've found! It's raining outside... and it's been like that since this morning. I often talk & discuss about the weather with my year1/2 children when we have an unusual(?) weather. 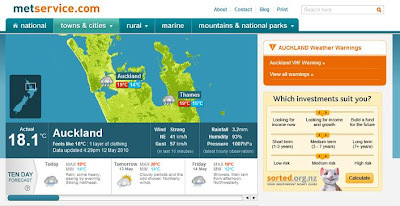 I use my interactive whiteboard to show metservice website to the children. We talk about different weathers and their symbols. It is good for their oral language and vocabulary. Today, I'm going to introduce a web 2.0 tool that's related to weather. 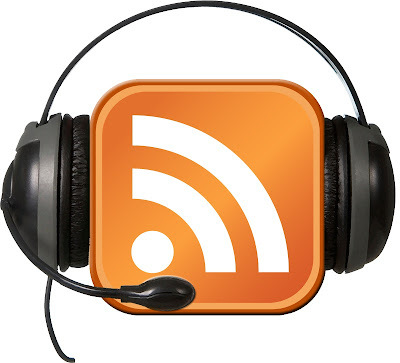 I heard about 'podcasting'4 years ago, when I first attended Learning@School Conference in 2007. 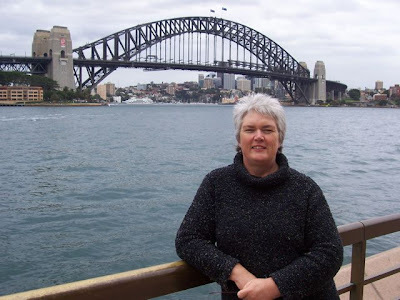 One of the breakouts (workshops) was about podcasting and the presenter was Allanah King who is now the deputy principal at Appleby School in sunny Nelson. Although her presentation and the podcasts that she made with her students were amazing and 'wow'ed all the people there, I couldn't really see its uniqueness, usefulness or effectiveness (until now actually). I personally think video-clips are far better as it's the combination of 'visual' features and 'sounds'. 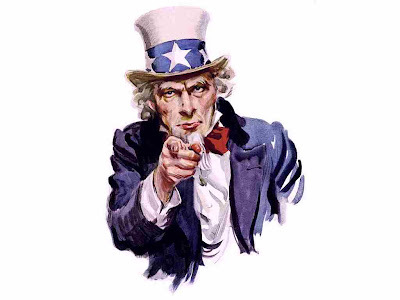 When you can produce a video-clip so easily, (it is so simple these days to make a video clip with your digital camera and it is also easy to upload it on 'teacher-tube' or 'youtube' to use it on your wiki, blog or school website) why would you want to make 'podcasts'? 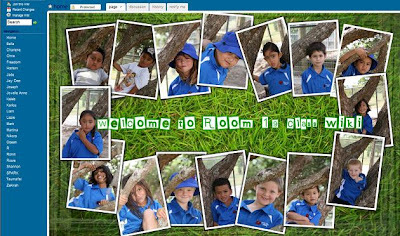 While I was finishing off my weekly planning for next week, I searched for some web 2.0 tools that I can use with my year 1/2 students for our ICT session & I found this image on Google. 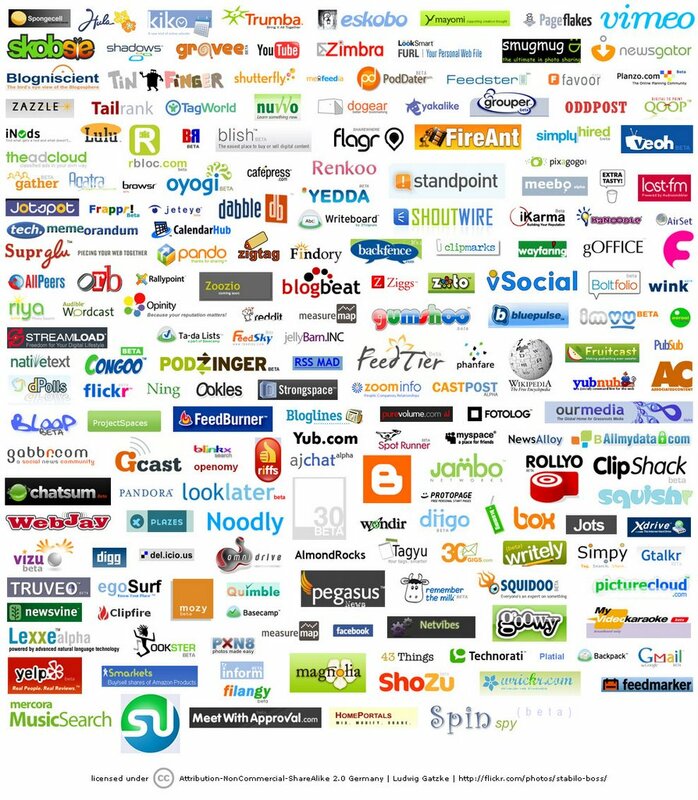 Obviously, there are heaps more web 2.0 tools other than the ones on this image, but it just shows us the interminable potentials in education. View more presentations from Cindy Wright. Our students, who are the 21st century learners, are often called as digital natives and they are surrounded by new technology. Cindy Wright, who is the creater of the slideshow above, argues that our students should have these skills: communication, innovation, creativity, problem solving, interactive, collaboration and critical thinking. These skills can be facilitated with the use of Web 2.0 tools, which enable students to read and also write contents on web pages. I think... one of the most popular Web 2.0 tools is wikis. I am a primary school teacher and I've been using one since 2008. 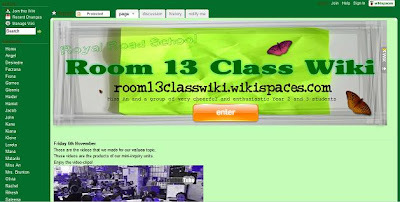 When I first started using my class wiki, the main purpose of it was to give an opportunity to students to learn after school hours. However, it was difficult for students to access the wiki at home. My school is a low decile school (decile 2) and majority of students do not have the internet access/computer at home. Last year, when I was in a year2/3 class, there were a few students who used the wiki at home. This year, however, I 'm in a year1/2 class and I think it's even harder to encourage them to use it at home. For this reason, our class wiki is now used like a 'learning log' that I use to record what's happening in the class and what we are doing. Although it is very common and popular that today's students share their life and experiences through various social network sites such as facebook, twitter and bebo, it is very important for them to recognise that any social network can potentially be dangerous. 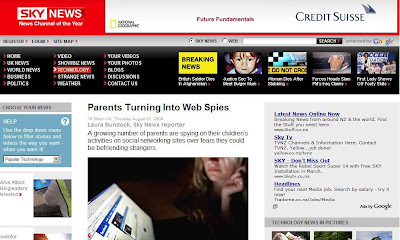 It is also crucial that students understand about cyber-safety and that they should be careful with the contents that they upload on the sites.